At a critical context for Morocco’s tourism sector marked by a drop of 4.3% in foreign tourist arrivals by the end of July compared to the same period last year, the Moroccans living abroad who visited their country of origin rose by 4.7% during the same period. Statistics released by Morocco’s tourism promotion office (ONMT) show that Morocco’s tourism sector has taken a toll as a result of multiple factors, chief among which the confusion in tourism markets fed by the instability in some north African countries. Arrivals from the UK, Germany, France and Italy dropped by 7%, 3%, 2% and 2% respectively, said the ONMT, which notes a slight increase in arrivals from Spain, Belgium and the Netherlands of 1%, 1% and 2% respectively. The same source shows that 59% of tourist nights were registered in Marrakech and Agadir, which both posted a 1% increase. At the national level, the hotel occupancy rate stood at 37% by the end of July, that is a two-point drop compared to July 2015. 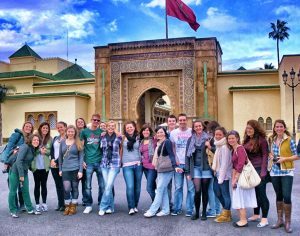 To boost the Kingdom’s attractiveness to foreign tourists in a tense regional context, Morocco’s tourism promotion office (ONMT) adopted an emergency plan providing for a set of measures ranging from opening new air routes, launching promotional campaigns to showcasing Morocco’s attractions and using the Climate COP22 Summit to attract more tourists. The measures were adopted during a closed-door meeting between the ONMT and professionals of the tourism sector in Morocco who took stock of the current unprecedented crisis that is worsened by the spread of amalgams in Europe in a context marked by soaring regional instability. Written by: Jaber Ali on September 11, 2016. Posted by Jaber Ali on Sep 11 2016. Filed under Headlines, World News. You can follow any responses to this entry through the RSS 2.0. Both comments and pings are currently closed.